All NOSA members or their guests bringing firearms to a NOSA Range shall have a valid Firearms Licence known as the Possession Acquisition Licence or P.A.L. with them. Every firearm in the restricted or prohibited class must be accompanied by its Firearm Registration Certificate. Any firearm (including non-restricted) being so transported must be unloaded and properly secured in transit according to provincial and/or federal firearms regulations. The NOSA Club Outdoor Shooting Range is known as the Nolalu Shooting Range or the JR Range. NOSA can use #1 and #2 shooting ranges there on Club Days Thursday and Friday and Saturday and Sunday from May through October inclusive between the hours of 9:00 a.m. and 10:00 p.m. only. NOSA members unlock the outer main gate at the highway, enter, and relock this outer gate so only other authorized users can subsequently enter using their own keys. Inside the main gate there is a new sign to show the firing status of the entire range complex, which is hot if there is going to be firing on any of the ranges -- those used by NOSA or O.P.P. or other police forces. This main gate sign has two flags available, one red and the other green; the flag not being displayed up front is stored in a tube behind the sign. This new main gate sign should be opened to the "Range In Use Caution" side when the first shooter arriving at Nolalu enters the main gate, and exchange the green flag for a red one (meaning the range complex is hot). When the last person leaves the Nolalu range complex, change the main gate sign back to "Range Closed" and replace the red flag with the green one (meaning range is not in a firing state). The inner gate to the NOSA use ranges (#1 and #2) may remain unlocked only for so long as authorized users are present. The first NOSA member opening the inner gate shall also reconfigure this "RANGE CLOSED" sign to notify that the range is in use. The last NOSA member present puts this sign back to "RANGE CLOSED", locks the inner gate, and then also ensures the outer Nolalu main gate is locked on departure. There are actually two NOSA shooting ranges here. 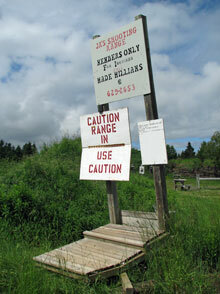 Range #1 has targets at 25 metres and is for rimfire or centerfire pistols, and rimfire or centerfire rifles. Range #2 is for any rifles, with targets fixed at 100, 200, or 300 metres (targets must not be moved to other distances, or set up at other locations). No pistol shooting is permitted here. Range #1 and the 100 metre portion of Range #2 may be used to sight in a shotgun with slugs; the use of a shotgun with shot is expressly forbidden on these Nolalu ranges and any such violation may result in expulsion from the range and from NOSA. NOSA members shall sign in to the attendance book (located in the locked box, same key, between Range #1 and #2) each and every day they use the shooting range. Any guest who shoots must also sign the attendance book. Targets shall be attached to the provided target frames (which are directly in front of back-stops) well inwards from the frame's outer wooden structure, to prevent major damage to the wooden frame. NOSA members shall clean up the range of cartridge cases and other debris and remove targets after shooting. There is a trash barrel on site. NOSA members shall keep the washroom facilities clean and tidy. All guests must be accompanied by a NOSA member (who is responsible for the actions of each guest and must supervise their shooting). Guests will be expected to join the NOSA Club after three visits. Any NOSA member who brings a particular guest in excess of the three permissible visits without the guest having joined may have his/her own membership revoked. NOSA members are not permitted to loan out their shooting range key to non-members. If a member loans out the shooting range key to a non-member, the membership may be revoked. There will be no refund of membership fees in such instances. 300 Metre Targets. 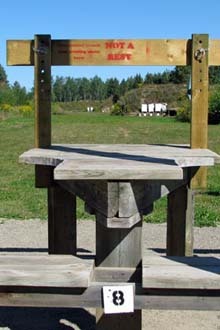 In this picture is the large wooden baffle that must be used for shooting at 300 metres, which is permitted only from a sitting position at either of the two leftmost benches. Bench shooting here is done with the rifle supported by your arms (or a rest) on the bench, with the barrel pointed under the baffle. 100 and 200 Metre Targets. In this picture is one of the new fittings for use during shooting from the right hand benches at the 100 and 200 metre targets. Bench shooting here is done with the rifle supported by your arms (or a rest) on the bench, with the barrel pointed down range under the cross-bar. Shooting Range Flags. Members shall ensure the correct flags are erected for the particular shooting range being used. Flags on the near end of the berm separating Range #1 from Range #2 (one flag for each Range) only indicate whether or not that particular range is now in use. -- The GREEN FLAG here indicates a totally safe range with no firearms in use for shooting. 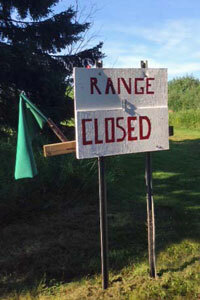 -- The RED FLAG here indicates caution, that the range is in use for shooting. Actual firing on a range is controlled by the use of additional flags as described below. Range #1. When this range is in use for shooting, there is an additional flag displayed on the right wall near the firing line. -- The GREEN FLAG here indicates that all firearms are unloaded and laid down with action open and muzzle pointing down range; shooters may then advance forward of the firing line and targets may be changed. -- The RED FLAG here indicates that this #1 Range is in a firing state, and no one is permitted to be forward of the firing line. Range #2 (100M, 200M, and 300M). When this range is in use for shooting, there is an additional green flag available that is mounted on a weighted pole that is located immediately in front of the firing positions. -- When a cease-fire-unload order has been given, and all firearms have been unloaded and laid down with action open and muzzle pointing down range, this green flag will be stood erect by the Range Officer, or senior shooter present, and only then may shooters advance forward of the firing line and targets may be changed. -- Upon the return of all persons back safely behind the firing line, the Range Officer or senior shooter present will lay this green flag down on the ground, and upon returning himself/herself behind the firing line, order that firing may commence. Hearing protection is mandatory for all persons at or near the firing line while shooting is taking place, whether they are firing or observing. Shooting protective glasses are highly recommended. Some Safety Vests are available in the sign-in box. Please ensure that you, or at least one person in your group proceeding down range, wears a vest -- particularly when going to the 200 or 300 metre targets. Anyone that is not a NOSA current member and is on the NOSA portion of the Shooting Range on NOSA Club Days is trespassing if not accompanied by a current member of NOSA; if such trespasser does not leave voluntarily and is causing a problem, telephone for the O.P.P. to remove them. Any person who is impaired by, or appears to be under the influence of, alcohol or marijuana or any drug shall not shoot or handle firearms on a NOSA operated range, and no one shall bring alcohol or marijuana or an illicit drug onto a NOSA operated range. No adult member is permitted to shoot on any range, at Nolalu or at Arnone, unless they are clearly displaying their current NOSA membership card in the provided card case on the club lanyard, which is worn about the neck. Similarly, adult guests shooting on these ranges must wear and clearly display the official NOSA club guest lanyard. Adult persons not displaying the above proper NOSA identification will be removed from the firing area. Additional Range Standing Orders or Match Standing Orders or NOSA Rules as applicable may be found posted at the shooting range. Official copies of printed updates may be handed out at club meetings and/or posted at the ranges. In all cases safety is of paramount importance! 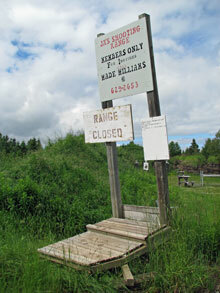 The Nolalu Shooting Range (aka JR Range) is located on the North side of Hwy 588 about one kilometre East of the intersection with Hwy 590. Directions from Thunder Bay. The easiest driving route to this shooting range from Thunder Bay is: Go West on Hwy 11/17, just past Kakabeka Falls turn left onto Hwy 590, and drive until you reach the intersection of Hwy 588 (stop sign), turn left (East) and drive about 0.9 km. and find the shooting range's entrance on the left (North) side of the road. Click here to see a drawn map to the outdoor shooting range. Copyright © 2010 - 2018 New Ontario Shooters Association. This site is copyrighted and no content may be reproduced by any means, including electronic, without written permission except for strictly personal use. Other websites wishing to post a link to this site are welcome to do so.